Today, Olympus America Inc. and Polaroid Corporation announced the first digital camera with photo printing capability in North America. 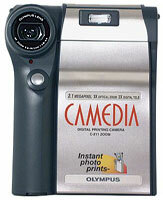 The Olympus C-211 Zoom leverages the strengths of both companies - Olympus with their camera technology and Polaroid with their “instant” photography and camera technology. This partnership creates the perfect camera for people who want a digital image for further image processing and archival but also want to have a “conventional” print right away. I could have used a C-211 when I have taken pictures of people’s cars digitally - now I could give them a print right away. This new C-211 ZOOM is a 2.1 megapixel, digital camera that stores images on SmartMedia digital film and has a built-in instant photo printer. It will be available in October 2000 and has a suggested list price of $799. It uses Polaroid 500 instant film which is sold as a 10-photo pack with a retail price under ten dollars. By being able to produce a high quality proof “in the field”, the C-211 can help verify that the desired image was captured properly and also serves as a hard copy backup, in case of any digital “errors”. It also provides proof that the stored digital image wasn’t altered, making the C-211 extremely useful in the insurance, real estate and construction industries, as well as for law enforcement and medical applications.